Homages and Tributes for the Thelonious Monk Centennial, But No Competition (For Now) As commemorative tributes take place across the country, the flagship jazz competition has quietly been put on hold. 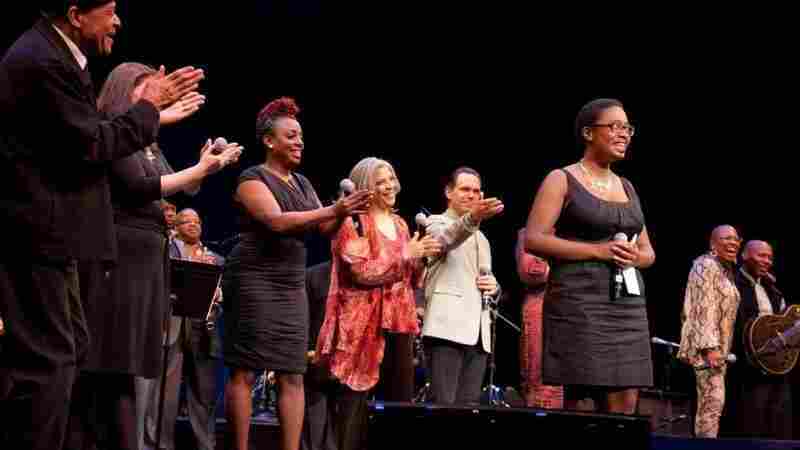 Cecile McLorin Salvant at the 2010 Thelonious Monk International Jazz Competition, onstage with Al Jarreau, Jane Monheit, Terence Blanchard, Ledisi, Kurt Elling, Dee Dee Bridgewater, and Kevin Eubanks. Thelonious Monk, the incomparably influential jazz composer and pianist, would have turned 100 today, and across the country a healthy range of commemorative tributes is already underway. But the flagship event that bears his name has quietly been put on hold: the next Thelonious Monk International Jazz Competition, which at one point had been scheduled for this week at the Kennedy Center in Washington, will not happen in 2017. Tom Carter — president and cofounder of the Thelonious Monk Institute of Jazz, the nonprofit organization that runs the competition — cited a recent barrage of natural disasters, and the pursuant philanthropic strain, as factors in the decision. "This is our only benefit each year," he said. "We do all of our programs for free, year-round. So mixed with many other things is: This is not the time to be doing a benefit, with all of the money being raised around relief for these hurricanes and earthquakes, and so on." 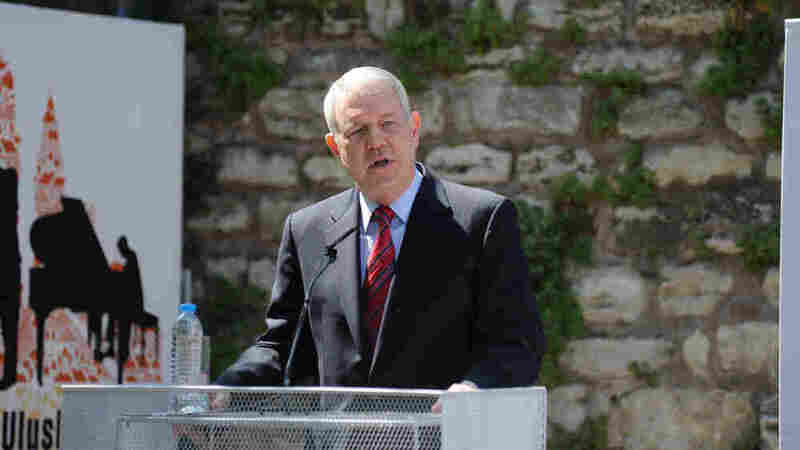 Tom Carter speaks at an International Jazz Day Artist press conference in Istanbul on April 29, 2013. The Monk Institute operates a range of educational programs — the most visible of which is a two-year postgraduate program, the Thelonious Monk Institute of Jazz Performance, currently housed at the UCLA Herb Alpert School of Music. In partnership with UNESCO, the institute also plans and organizes International Jazz Day, held each April 30 as the culmination of Jazz Appreciation Month. Just yesterday, UNESCO announced the next two global host cities for International Jazz Day: Saint Petersburg, Russia (2018) and Sydney, Australia (2019). Against this hum of organizational activity, the absence of a competition in 2017 is unfortunate for more than just the obvious reasons. In addition to being the centennial of Monk's birth, 2017 marks the 30th anniversary of the Monk Competition, which has been the most prestigious and consequential event of its kind in jazz. T.S. Monk, who describes himself as the gatekeeper of his father's legacy, takes unabashed pride in the competition's alumni circle. "Early on I said, 'We want to really help develop the next generation of young jazz musicians,'" he noted. "I think I can say with a fair amount of confidence that we've probably put more actual stars in the marketplace than any other jazz organization." T.S. 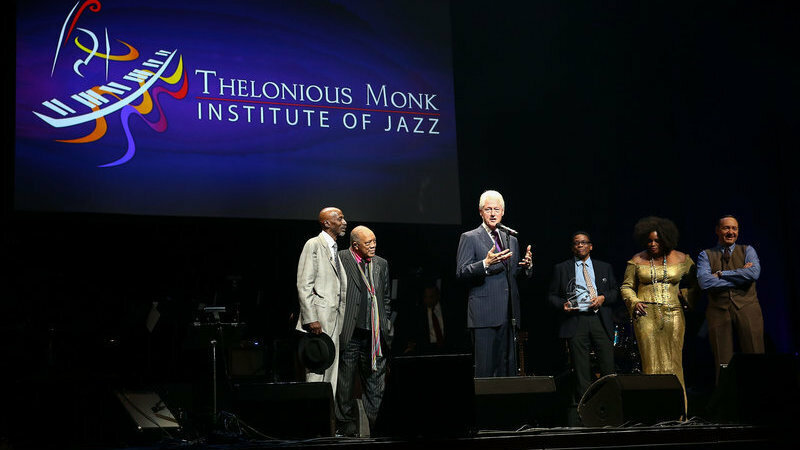 Monk, left, in 2014, when the Monk Competition included the presentation of an award to President Bill Clinton. Also onstage: Quincy Jones, Herbie Hancock, Dianne Reeves and Kevin Spacey. The Monk Competition has a rotating instrumental focus, and this year's spotlight was to fall on the piano, another missed opportunity in this centennial year. Roughly a dozen semifinalists had been selected and notified by a jury committee — and they're still in the running, despite some chatter that the competition had been canceled. "I don't know where that rumor circulated, but that is not accurate," Carter responded. "It's postponed; it is not canceled. I'm not sure exactly when we're going to have it, but it will be sometime after the first of the year." The most recent Monk Competition took place in November 2015, when Jazzmeia Horn won in the vocal category. One of the early signs that this year's event might not proceed as planned was a conflicting engagement: several months ago, Jazz at Lincoln Center updated its schedule to show that T.S. Monk would be spending this week in New York, rather than Washington, D.C. The T.S. Monk Sextet appears on Tuesday and Wednesday at Dizzy's Club Coca-Cola. When asked directly whether he would be involved the Monk Competition going forward, he responded briskly: "I'm sure I will," he said. "I've been involved in every competition we've ever had, and I don't foresee that changing at all." 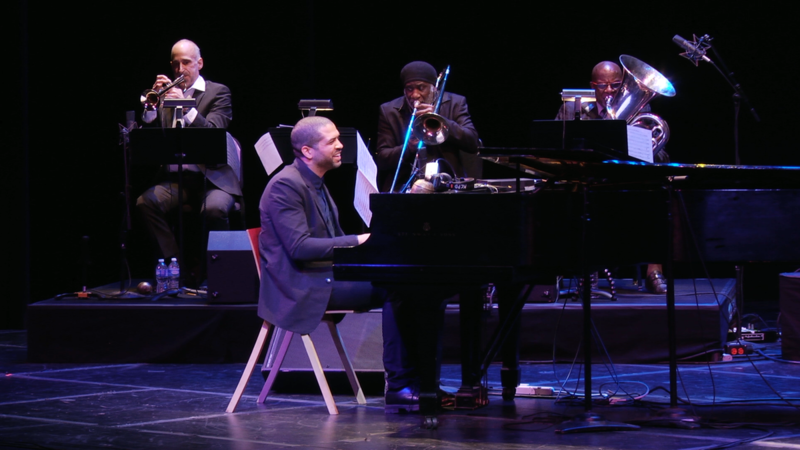 Jason Moran performing 'In My Mind: Monk At Town Hall, 1959' at the Kennedy Center in 2015. At the Kennedy Center, where the competition was originally scheduled, a tribute was held this past Sunday by pianist Jason Moran, who will also present his project IN MY MIND: Monk at Town Hall 1959 on Saturday at SFJAZZ. At Jazz at Lincoln Center, a free Thelonious Monk Symposium will be held on Thursday and Friday. Thursday's program will include Unheard Thelonious Monk Tapes, a listening party featuring previously unheard material, and insight from panelists including Monk biographer Robin D.G. Kelley. On Friday, Zev Feldman and Greg Thomas will discuss Monk's recently issued soundtrack to Les Liaisons Dangereuses, and screen the film. And Duke Performances, in Monk's original home state of North Carolina, is presenting Monk@100, an ambitious and intriguing 10-day concert series curated by pianist Ethan Iverson. The series kicks off next week with a three-day residency by The J.D. Allen Trio, featuring guitarist Bill Frisell (Oct. 17), trumpeter Dave Douglas (Oct. 18) and pianist Kris Davis (Oct. 19). Moran will perform in a duo with percussionist Tyshawn Sorey (Oct. 20), and a program called Monk Songbook (Oct. 21-22) will feature Iverson with a handful of other pianists. From Oct. 23 to 26, Iverson will be in residence with a trio, featuring bassist David Williams and drummer Victor Lewis, and a succession of prominent saxophonists — including a few with personal experience in the Monk Competition, like Melissa Aldana (Oct. 23), Chris Potter (Oct. 24) and Joshua Redman (Oct. 25). T.S. Monk characterized the outpouring of centennial tributes as a validation of sorts, and entirely separate from the issue of the competition. "When I was five years old, people would say to me: 'Fifty years from now, your father will probably be more famous and his music will be more important than it is today,'" he said. "Today I'm 67 years old, and Thelonious is bigger, and his music is more important, than ever. So all of this attention on the centennial, for me, is confirmation of things that people told me when I was a little kid. It has certainly come to fruition. I'm amazed and very, very happy for him."